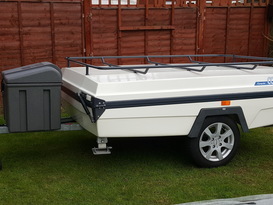 This is the lightweight 4 berth trailer tent that can even be towed by small cars. It has 2 double bed areas that are off the floor with zip down doors for privacy. Ideal for 4 people or two adults and 3 small children. This can be set up by one person, check out Camp-let videos on YouTube to see how easy these are. The awning is already part of the trailer tent so less time getting set up to enjoy your holiday! There is plenty of ventilation with the windows opened up and the mesh keeps the flying guests out! The Camp-let Concorde comes with swing out kitchen that has a sink with tap and a gas hob, storage is in the kitchen unit and also under the bed skirt. Electric hook up cable and cutlery and dishes are included in this rental. We have two Camp-let Concords to let so your extended family or friends could join you! Dimensions 18 square meters. 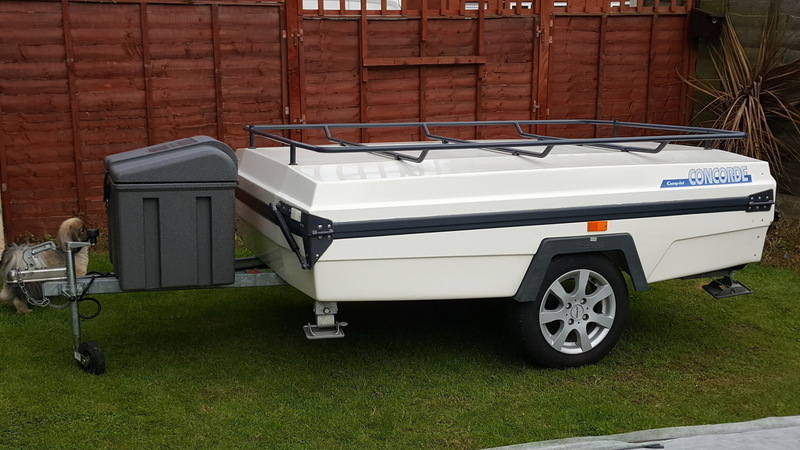 Net weight 250 kgs, Load capacity 250 kgs, total weight laden 500 kgs. Width 4 meters, length 5.73 meters.